This cake reproduces Joseph Mallord William Turner's painting of the Rhine city of Cologne, on view at The Frick Collection. Beneath the hand-painted image is lemon cake with lemon curd, strawberry filling, and creamy Swiss meringue vanilla buttercream. 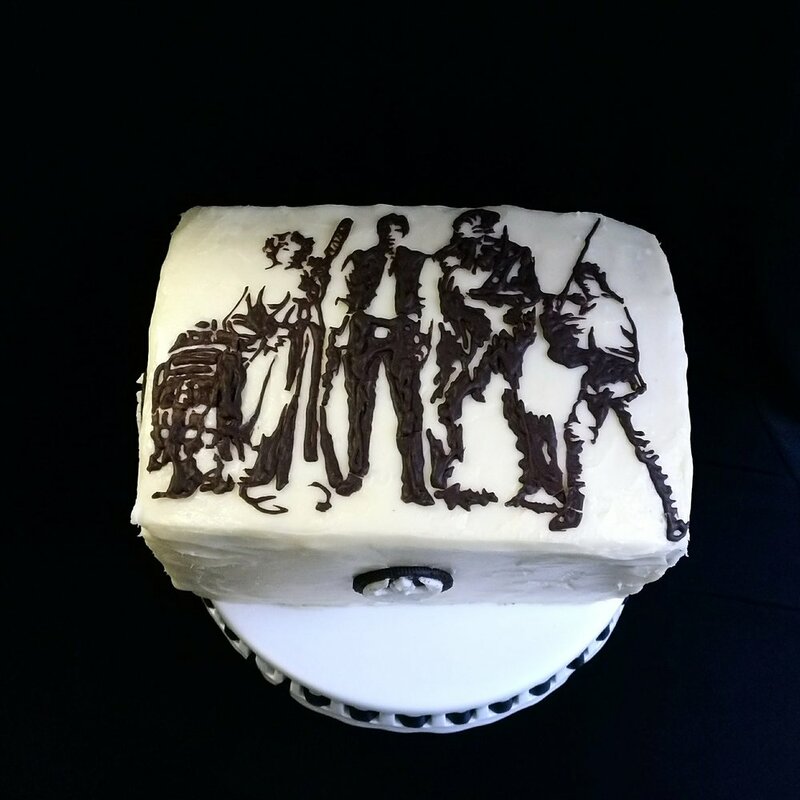 This cake was inspired by the wonderful series by Philip Pullman. With gingerbread cake layers (a reference to Ma Costa's gingerbread of course), blackberry jam, chocolatl mousse, and a dark chocolate ganache, this cake will transport you to Lyra's Oxford and beyond. Chocolate cake with Oreo filling and vanilla buttercream proves that no matter whether you choose the dark side or the light, they're both equally delicious. Inspired by Vincent van Gogh's Cafe Terrace at Night his elegant lavender and lemon scented cake is a little taste of the south of France. 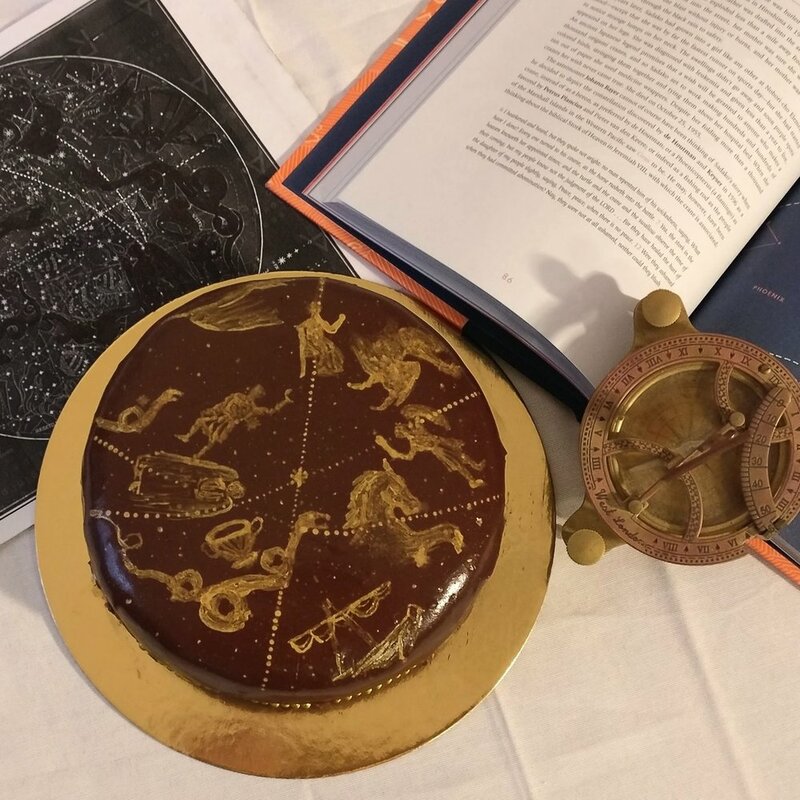 The perfect accompaniment to a night of star-gazing, this chocolate cake is filled with a cinnamon chocolate mousse, and topped with a tea-infused dark chocolate mirror glaze. The devil is in the details, and this detail is taken from the tiled floor in Jan van Eyck’s Virgin and Child with Saints and Donor in NY’s Frick Collection. These personal-sized cakes feature traditional Dutch flavors like almonds, spiced apricots and vanilla cream and are decorated with with blue and white buttercream. 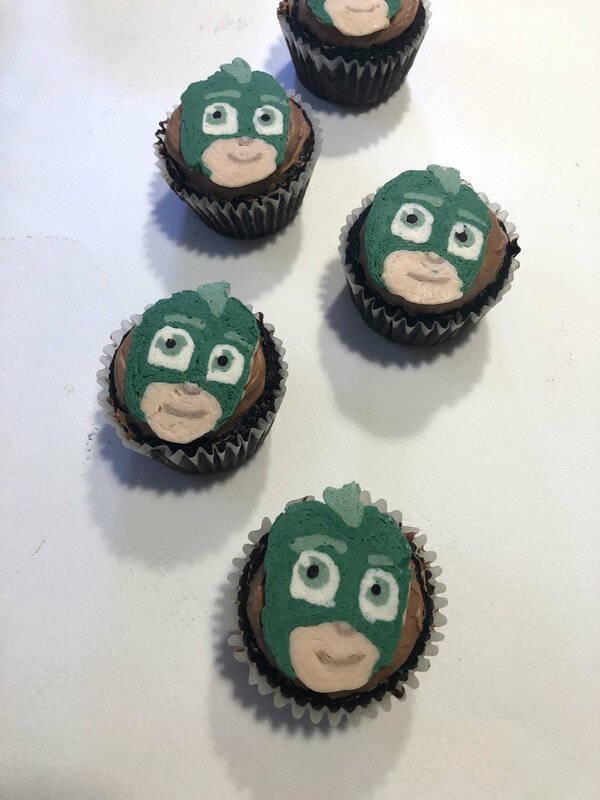 These PJ Masks-inspired cupcakes are almost too cute to eat! But once you get whiff of that milk chocolate buttercream you just can’t resist. This minion cake keeps it sweet and simple--buttermilk chocolate cake frosted with vanilla bean buttercream. Gone faster than you can say "banana". What do when you're commissioned to do a cake for a Rembrandt-themed baby shower? 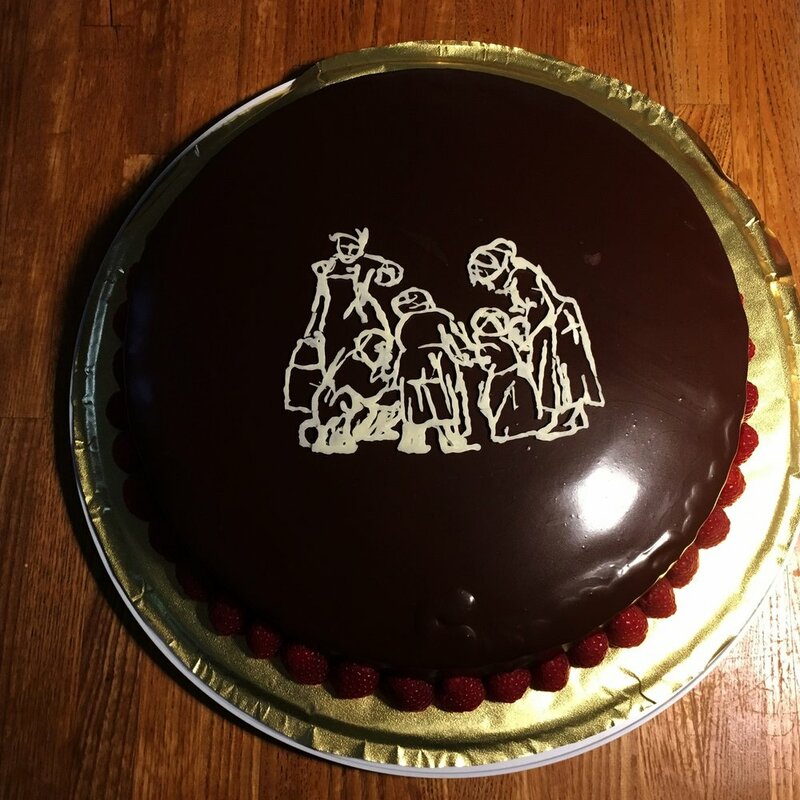 Put that art history degree to work and recreate one of the master's sketches in chocolate of course! Unlike the original, this work of art is composed of a chocolate sponge cake filled with a cinnamon-spiked chocolate mousse, covered in a tea-infused dark chocolate ganache and decorated with a white chocolate sketch and raspberries. Four layers of yellow cake separated by homemade raspberry jam and covered in buttercream frosting in the Ravenclaw house colors. Each of the four Hogwarts houses is represented with a hand-painted gingerbread cookie crest which are arrayed surrounding a silhouette of Hogwarts Castle (Hogwarts letter not included, see owl for details). Rich red velvet cake covered in fluffy cream cheese frosting with white chocolate ears. 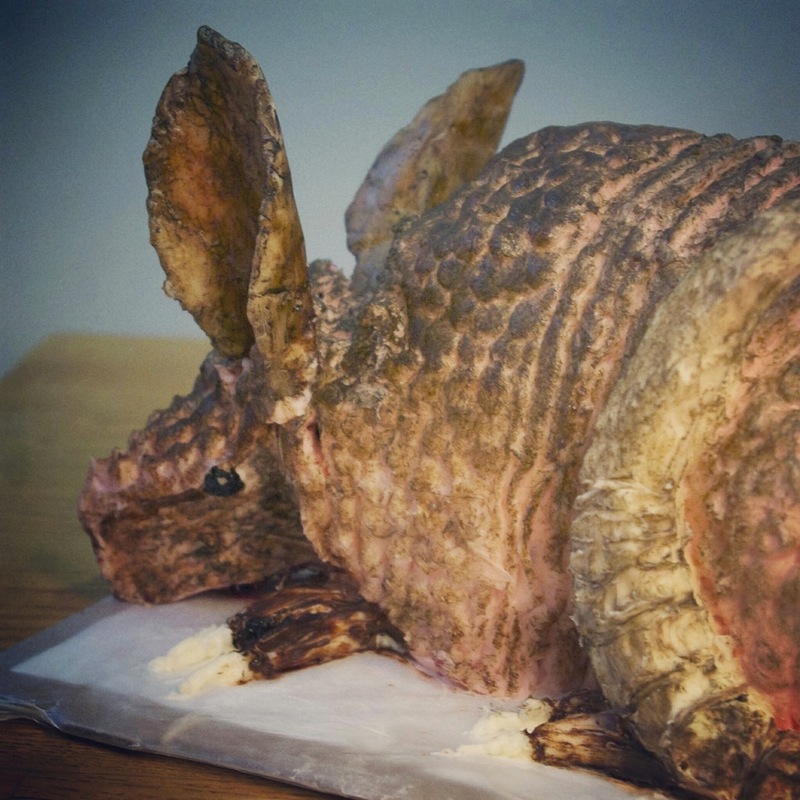 Although it takes its inspiration from the movie Steel Magnolias, this cake goes well beyond the original in terms of armadillo-accuracy. Sometime a remake can be a good thing! 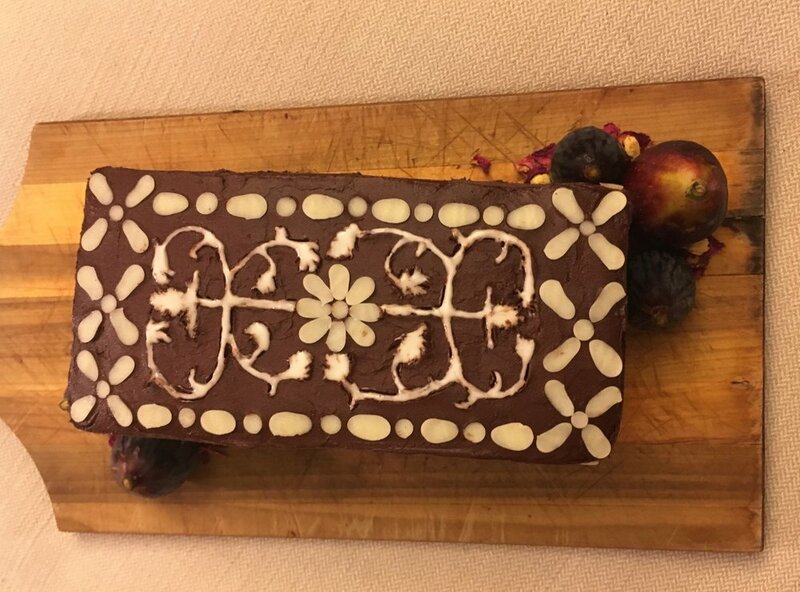 Inspired by the beautiful inlays of Damascus boxes, this vanilla cake is covered in dark chocolate ganache inlaid with white chocolate mother of pearl. Layers of classic chocolate cake with creamy vanilla frosting enclosed in a white chocolate shell and finished with Kit-Kat tire treads. Almost too cute to eat! Fudgy chocolate cake covered in chai-spiced cream cheese frosting. Must eat faster, must eat faster. Two layers of almond cake separated by strawberry jam and covered in a rhubarb mascarpone mousse. On top four handcrafted chocolate reproductions of Italian Renaissance portrait medals filled with chocolate ganache rest on a tart rhubarb glaze. One of the few times museum workers were encouraged to please eat the art.